ABOUT DOUGLAS M. STANDRIFF, ESQ. My career has always been focused on trial work. Most of my time is spent IN THE COURTROOM, not in my office. 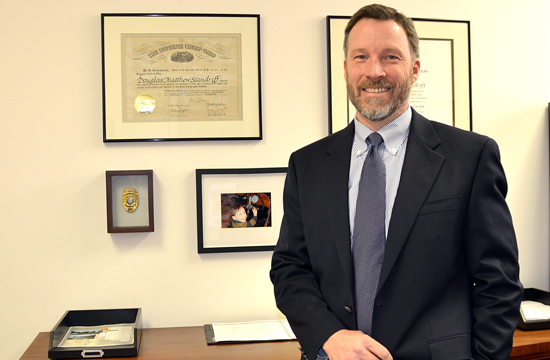 The hours spent in the courtroom allowed me to become Certified by the Supreme Court of New Jersey as a Civil Trial Attorney. Beginning in Texas when I served as an Assistant District Attorney handling serious felony trials, through today, my clients hire me to take their matter to the Courthouse. I have been admitted to the Bar in four States: Texas, Ohio, New York, and New Jersey, and have been admitted to practice in the Federal Courts in Texas and New Jersey. I have successfully handled over 1,000 civil matters on behalf of my clients. Some of those matters were settled through negotiation, and some were prosecuted to a conclusion in trial. This is the briefcase I carry into the Courthouse to appear for case management conferences, arbitrations, and jury trials. It’s a bit scuffed, a little beaten up. Some people say that I should get a stylish new briefcase to replace it. I disagree. 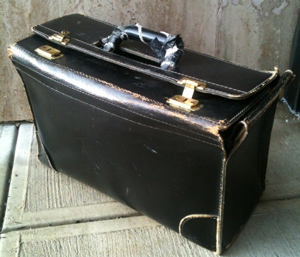 I like this weathered briefcase, because it shows anyone who sees it that the owner is a lawyer who works in the trenches – one who uses his briefcase every day. This is not an accessory that sits untouched in the corner of my office – it’s a veteran with war wounds, proudly displayed. 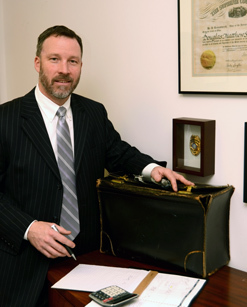 For the first twenty years of my practice, this briefcase has been next to me and my client at counsel’s table through many trials. With a bit of refurbishing from time to time, I expect it will be with me for the next twenty years too. Today, I concentrate my practice in two areas, Civil Litigation and Property Tax Appeals. Civil matters are heard in the Superior Court, and Tax Appeals are heard in the County Tax Board or the Tax Court of New Jersey. Significant settlement for a 26 year old woman struck by a commercial truck while stopped at a traffic light on Route 10, who suffered a herniated disc which ultimately required surgery to remove the herniated disc and fuse the joint at Cervical Level C4-5. Prosecuted a civil wrongful death case on behalf of two daughters whose mother was killed in a car accident in Paterson, New Jersey. Fought to force a large New Jersey insurance company to continue to pay for a client’s pain management treatments after spinal surgery failed to reduce his pain caused by a herniated disc. Represented the Estate of a local police officer who was killed by a drunk driver. Wrongful Death suit against a careless smoker who started a fire in a multifamily building, which resulted in the death of my client’s mother who was forced to jump from the 3rd floor of a burning building. Large residential estate in Bergen County: 2010 taxes reduced from $42,770.99 to $31,860.00, a savings of $10,910.99. Successful appeal of 3 condominium units in Union City, Hudson County, resulted in yearly savings for each unit owner in excess of $4,600. Taxes on Commercial building in Leonia (law offices) reduced by 10.8%, resulting in substantial yearly savings. Ridgewood property’s assessment reduced from $3,600,000 to $3,000,000. Savings over three years was in excess of $19,900. South Orange tax appeal for a large estate property, produced savings of $4,200 per year. Numerous successful collection matters for medical office. Filed an action against a Trustee who failed to properly pay the beneficiary named in her grandmother’s Will. Malpractice claim against an accountant for improperly handling a small business owner’s taxes. Successful repossession of trucking equipment for an Ohio truck leasing firm. Defended a U.S. citizen in a Civil forfeiture action by United States Border Patrol accused of illegally attempting to remove $130,000 in US currency. Do you have a case that requires the skill of an experienced trial attorney? Please call me at (201) 445-4555 or send an email for a free consultation.